A plan to build an airport fence on land in California that once served as a Japanese-American incarceration camp is angering opponents of the proposal who believe it’s an affront to the men, women, and children who were forced to live there. The property that today includes the Tulelake Municipal Airport was once used as part of the Tule Lake Segregation Center, where U.S. citizens and legal residents of Japanese descent were incarcerated during World War II. A project in the County of Modoc, California, not far from the Oregon border, calls for enhancing airport safety by erecting an 8-foot-tall fence that stretches roughly 3 miles along its perimeter. Barbara Takei, whose mother and mother’s family were sent to the Tule Lake Segregation Center, told NBC News she opposes the fence. “It’s a place that is a very emotionally evocative experience to go [to], where you or your family was incarcerated for the crime of having a Japanese face,” said Takei, an officer of the Tule Lake Committee, a group of segregation center internees and their descendants. Modoc County road commissioner Mitch Crosby told NBC News in an email that the proposal calls for replacing a deteriorating barbed-wire fence with one that can keep deer, coyotes, and dogs out of the active airfield. Federal Aviation Administration (FAA) spokesperson Allen Kenitzer said fencing at airports is required for safety and security. “[The Transportation Security Administration] requires the fence to prevent unauthorized access to the airfield and FAA requires it for wildlife mitigation,” he wrote in an email to NBC News. The Tule Lake Committee has filed two civil lawsuits challenging the legality of a lease for the airport, specifically referencing the fence. Takei said another meeting with a judge about settlements is scheduled for November. As of Wednesday afternoon, Modoc County and the City of Tulelake have not respond to requests for comment about the lawsuits. Modoc County said in government documents that it’s preparing an environmental assessment for FAA review and approval. That’s a necessary step since the county plans to apply for federal grant funding for a portion of the fence and because construction could impact the environment, according to a county notice. A determination will be made whether the proposed fence will affect property on or eligible for the National Register of Historic Places, the notice said. Measures to protect the site or lessen any identified adverse impact to it will also be described. The FAA and Modoc County have begun coordinating with the California State Office of Historic Preservation and other interested parties under the National Historic Preservation Act, the document said. Tule Lake Segregation Center was designated a national historic landmark in February 2006, according to the National Parks Service. It is also a unit of the World War II Valor in the Pacific national monument. For nearly three years during World War II, the center served as a destination for already interned Japanese Americans the government deemed particularly "disloyal" to the United States. At its peak, the camp housed more than 18,000, many of whom protested their incarceration by refusing to take loyalty oaths issued by the federal government. 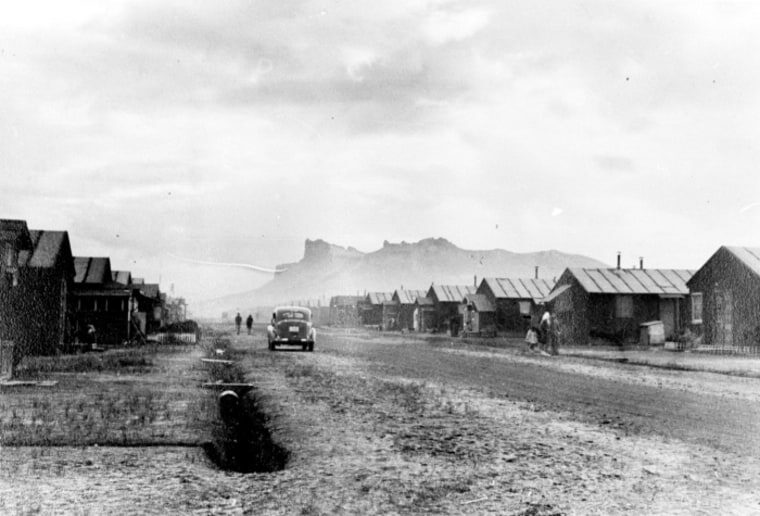 In all, more than 110,000 Japanese Americans were held across 10 camps during the war. Takei said she believes the fence proposal dates back to around 2004. Barbed wire fencing currently encloses parts of the single-runway airport, while other areas have nothing, according to Modoc County. The Tule Lake Committee, which gives tours of the former segregation center site, has recently stepped up efforts on social media to encourage opposition to the fence. In addition to Facebook and Twitter, Takei said, a petition begun four years ago is also attracting renewed attention. To date, it has received more than 36,000 signatures. Modoc County held a public meeting on the project last week. A 45-day public comment period remains open through Oct. 10 before the county drafts an environmental impact report and assessment.